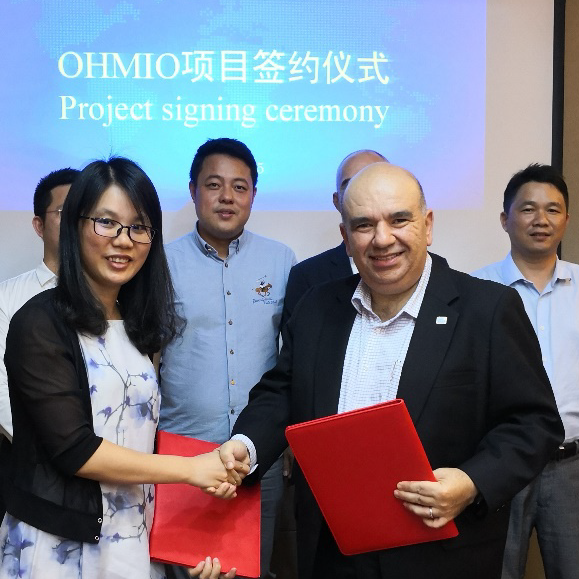 HMI Technologies/Ohmio announces a US$20 Million investment agreement with the Heshan Industrial City Management Committee to establish an Ohmio manufacturing plant for Autonomous Vehicles and an Artificial Intelligence Transport Research Centre in the City of Heshan, China. The agreement was signed by Mohammed Hikmet, the founder and Chairman of HMI Technologies and its subsidiary, Ohmio Automotion Ltd, and the Deputy Director of the Heshan Industrial City Administration Committee, Wu Xiaoqing. “This is another milestone for the success of Ohmio and another ‘vote of confidence’ in Ohmio, following the signing of the Solaseado MoU in Korea earlier in April”, Mohammed Hikmet said after signing the agreement. “Not only will Ohmio be able to meet its mass production requirements inside and outside of China, but this investment also adds a huge boost to our existing research activities in establishing an autonomous platform solution as part of an entire ecosystem”, said Dean Zabrieszach, CEO of HMI Technologies/Ohmio. “New Zealand Trade and Enterprise, the New Zealand Ministry of Foreign Affairs and Trade and Auckland Tourism, Events and Economic Development helped HMI Technologies/Ohmio to accomplish this agreement and without them it would have been very difficult to achieve what we have achieved today”, Hikmet said. “Whilst this is an important milestone for the company, HMI Technologies/Ohmio regard it as a first step in the process of building the company as a global autonomous vehicle manufacturer. We will continue to work with NZTE, ATEED and MFAT to secure the company base in New Zealand and Australia, and to gain a foothold in other markets such as Europe and the US”, Hikmet said.